Before Season Two began, I wrote a list of five reasons why Gotham would improve in the coming year. One of the five, and perhaps the most important, was a lack of predictability both within individual episodes and from week to week. So many hours were undercut last year because the outcome was obvious, but three episodes into the sophomore effort and Gotham is making my list look like a premonition. As I always do when I’m about to praise an episode of Gotham, I’ll start this review by saying “The Last Laugh” was not a perfect hour of television. Far from it. The show is still hampered week in and week out by subpar writing that fails to meet the heights the show’s increasingly intriguing storylines aspire to reach. After the death of Captain Essen, there was little doubt that the succeeding episode would contain a generous helping of serious drama. But, serious drama is a category this show has significant trouble with, leaving us with many a scene that felt awkward or flat throughout the night. Luckily it didn’t overpower the episode, which instead put much of its focus around a fancy ball, and the Maniax once again looking to wreak havoc. The biggest improvement from Season One for Gotham has been the increased focus in each episode. No longer is the show trying to cram in numerous storylines each week, which constrained too many episodes to count last year. Episode three is the best in that regard so far this season. Essentially, there was one storyline (the fancy ball) and everything else was either working toward that, or was a short aside. This is the benefit of the show’s newfound serialization. Everything is working toward something bigger each week, which opens up a bevy of time for the story to breathe. At first, I feared that Gotham was developing new bad habits while attempting to shed old ones. “The Last Laugh” set itself up similarly to last week’s entry and I began to worry that the Maniax attempting a mad spectacle and the GCPD trying to stop them had become the show’s new normal. Like last week, Jerome was once again the ringleader of the Maniax newest plan to dishevel Gotham. And, like last week, it was up to Gordon and his GCPD cohorts to stop him. But, just as I was beginning to moan and groan about the show falling once again into predictability, everything turned. Theo Galavan, who was unsurprisingly in the room in which Jerome was holding everyone hostage, began to challenge his apparent ally. My initial reaction was that the Galavans had planned Jerome’s little stunt only so that Theo could stop him and appear heroic. That is essentially what happened, but not, as Theo told Jerome, as they had rehearsed. If you paid attention to any of the noise about Season Two, you knew that Jerome was going to be a major player. As Gotham’s would-be young Joker, Jerome was billed as the figurehead for the Rise of the Villains this season. The first two episodes leaned quite hard into that, with Jerome front-and-center throughout much of the show’s first hours this year. There was so much riding on his character that I truly believed he would be around for the long haul—which is why I am absolutely giddy that Theo went off script and thrust a knife into young Jerome’s neck. The decision to kill off Jerome is exciting and interesting, and a move that Gotham needed to make to establish some credibility. Last week’s killing of Captain Essen felt safe, but this week’s decision feels revolutionary. Unlike last year, I no longer feel as though anyone in Gotham is untouchable. And that’s how it should be. Though, as the camera panned up over Jerome’s stark white, lifeless body, I couldn’t help but think that the writers will find some loophole. That next week he will rise from the dead, and become the king to all those newly laughing maniacs in Gotham that we saw at the end of the hour. We can only hope that what’s dead is dead. Some mop-up notes: it would behoove the show to add more Morena Baccarin who, as Dr. Lee Thompkins, elevates nearly every scene she is in. She nearly stole the episode with two wonderful moments, the first reassuring Gordon early on at the GCPD headquarters, and later when she got her flirt on with the one and only Alfred Thaddeus Crane Pennyworth. For the third straight episode, Oswald Cobblepot was relegated to the shadows, though “The Last Laugh” did contain a nice scene between him and Bullock. Hopefully we’ll get more of him in the next few weeks, otherwise the Penguin’s reign as King of Gotham will be woefully underutilized. Barbara Kean, as a Harley Quinn-esque villainess is actually working. Kind of. James Frain as Theo Galavan is building the kind of interesting villain that Gotham, despite often being a show primarily about villains has failed to produce. Now that we know a little more about his family’s roots in the city, I can’t wait to see what Mr. Galavan has in store. Finally, the most ridiculous thing about this show might be the hairstyles, they are constantly befuddling and so very enraging. ?The best thing I can say about Gotham Season Two is that its three episodes rank among the very best the show has ever produced. Unfortunately, that bar isn’t very high. But the trend this season is very promising. The commitment to serialization is paying off serious benefits and the writers look as though they have a bravery they sorely lacked last year. 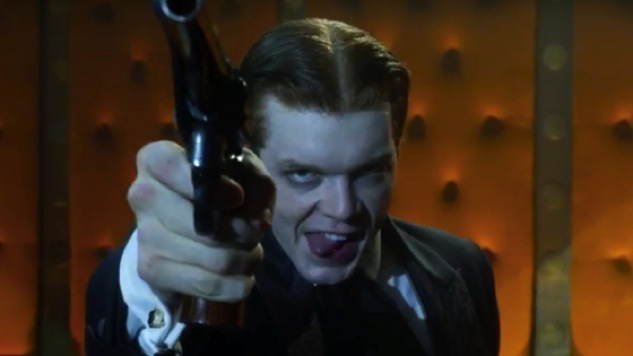 Before we lose ourselves and claim that Gotham is venturing into must-see territory, it’s important to note that “The Last Laugh” was largely helped by the surprising decision to kill Jerome. Remove that aspect and the episode is another dull hour pockmarked with poor writing. But the decision to kill Jerome is important enough to elevate the episode to a higher level. Now, Gotham just needs to keep pushing forward. Eric Walters is the Assistant Tech Editor for Paste, and a regular contributor to the TV section. For more of his thoughts on comic book television, listen to his podcast.